Myth: successful change management. Reality: Change resiliency. Change can spell disaster for your organization, but it doesn’t have to. With the right mindset and the appropriate skills, executives, managers, and individuals can emerge from change better than ever. 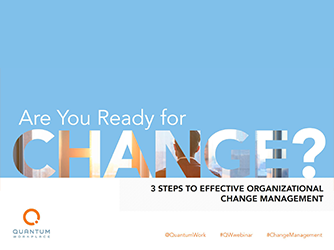 Join Megan Maslanka, Quantum Workplace’s Director of Client Success, as she dives into the challenges of and solutions for organizational change. A must-see for mid-management and above.